Is it ok for others to discipline your child? Boys A and B were playing near the edge of bed when Boy B's little baby sister joins in. She starts crawling towards Boy A and dangerously close to the edge of the bed. Boy A adores babies and always look out for them, he points his finger near her face and whisper "mei mei (little sister) go back." At this time Boy B got defensive and hit Boy A "HEY! Don't point! It's rude to point!" Boy A got mad, shows an angry face and elbows Boy B once, hard. Boy B cried out in pain and starts smacking Boy A, his screams sends baby sister crying and crawling towards auntie. Mama A who is at the other side of bed looked up from her phone and saw Boy B crying, smacking non stop and hard on Boy A's arm and thigh. Auntie struggles to carry baby sister while telling Boy B to stop hitting and trying to pull Boy A away. Mama A was coaxing Boy B, rubbing his back, telling him to stop hitting and crying. Boy A sat there with with no intention to move away and continue to let Boy B hit him. Auntie carried baby sister out to seek Mama B's help who came in asking "What happened". Boy B ran into her arms sobbing and crying while Boy A stood there straight faced. So, what do you think happens next? Did both Mamas defend their own boy? Accuse the other boy for being "naughty/defiant" and starting a fight? Read on. Mama B sat down on the bed and talked to the two boys trying to find out what happened while Mama A sat at a corner listening, letting Mama B handle the situation. For the next 15 mins or so after gathering all the info about the incident Mama B talked to the boys, explaining to both boys who did wrong and reason for the other boy's reaction. Mama B was stern and serious with both boys. Even chided Boy A for making funny faces and actions when he is suppose to be serious and listening to her. Boy A was wrong to have pointed his fingers so near to baby sister, what if she happens to move forward and her eyes got poked accidentally? Boy A should not have shown Boy B an angry face and the elbowing was uncalled for, this leads to Boy B crying out in pain and scaring baby sister. Boy B was wrong to raise his voice at Boy A for pointing at his baby sister though we know that he is trying to protect her. Boy B's continuous smacking on Boy A's arm and thigh was uncalled for too, he could have come to Mama A and complained about his behaviour. After both boys understand the reasons for both of their behaviour and actions, the rule of no hitting/screaming/shouting to your friends, every one hugged; even though still reluctant and sniffing, and were friends again. Only then Mama A brings Boy A to a corner and have a talk, to add on what Mama B have said and to reinforce what she has taught Boy A all along but he has forgotten about it at that instance; no pointing so close at someone's face/eye/nose. I think most parents would not have taken it well when friends or siblings discipline or correct their child's behaviour even in a well intended or in a calm manner, let alone one that is serious and reprimanding. However, we have to bear in mind that a child may behave differently behind their parent's back. And sometimes children may also do things that are dangerous, causing harm to himself or others and needed to be stopped or warned at that instant. You can't really hunt for the parent and then tell the parent what her child is doing then leave it to the parent to stop the child, it may be too late by then. My point is, there are issues that has to be dealt with there and then, at that moment. And I am perfectly alright if other friends or my siblings stopped DinoBoy for saying certain things or behavioring badly so long that they are not yelling mindlessly at him or belittling him or saying things that hurt him emotionally, hurting him physically is definitely not acceptable to me. If he really did something that calls for such actions (which I can't really think of any that is so serious), I think the parent should speak to me first, I shall be the one that takes the matter into my hand and deals with him accordingly. I am even ok if our little friends comes up to me to telling tales about my son coz they are kids and kids have a right to do so because we taught them to tell daddy/mummy/teacher/authority figure when some one misbehaves. Alright, now comes the difficult part. Would you have reacted like me; Mama A, took a back seat and let your friend, in this case its my friend Connie; MamaB handles the situation? Remember your friend was not there when the incident happened but you are. I saw what happened, even though DinoBoy was the one who started it, both boys were wrong to let it escalate. The reason for letting Connie takes over the situation is because Isa; Boy B was sobbing uncontrollably and needed comfort badly. Adding my presence to the equation would mean that DinoBoy; Boy A will think that I have his back and will try to deny every thing he did wrong. Isa probably think that I am helping DinoBoy to accuse him of behaving badly since I witnessed the whole incident. The boys needed some one who is neutral to settle the issue and I know Connie will do a good job. Also, if I joined in the discussion anything that comes from me would be deemed as accusation to either boy. Why do I have such faith in Connie? This is because as a teacher she deals with similar situations almost every day and is well, so call experienced if I may say, in settling kid's squabbles. And she did not disappoint me, she did a wonderful job of calming both boys down, talking sense to both of them and making them see each other's point of view. Having said that, will I let other friends do the same? Yes, because I have taught DinoBoy to fight his own battles. He knows when he is being wrongly accused by the other child/parent and will run to me for help. And I am glad that most of my friends; even my siblings, trusts each other's judgement enough to leave our children with each other while they play and to take necessary disciplinary actions against the children when needed. 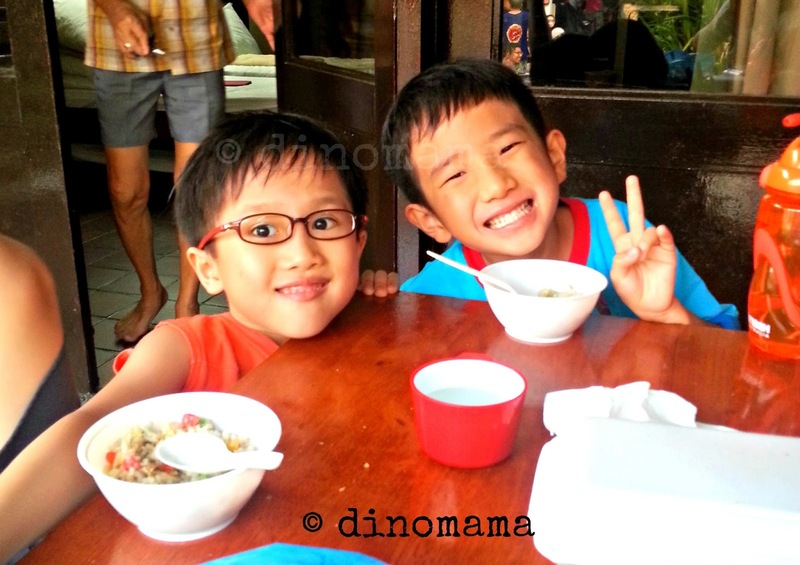 Here are the boys.... one minute they were enjoying each other's company, having loads of fun in the pool, wii-ing and sharing a packet of fried rice as dinner, the next minute they are fighting, arguing and crying. So glad the day ended with both of them still as good friends. While on a cab home, I asked DinoBoy about his feelings on the afternoon's incident but he kept quiet. I asked about his feeling when he fights with his friend. He mumbled softly "I feel bad", I let the feeling sink into him and that ended our discussion. Afterall the boys will not remember the squabbles, the tears or the red hand prints. All they remember are the fun they had in each other's company. Share with me, will you react the same way as I did or you will sit through the whole discussion? I'll do as you did, and be thankful for friends who care enough to mediate before any ill feelings between the boys can be left to fester. Friends do that. They look out for each other, and as adults, for each other's kids. When kids fight, there is always a perfectly (un)reasonable reason for it, and in their world, it takes so little to trigger unhappiness. It would have been so easy for someone to just tell them to stop it. Without bothering to diffuse the situation, or to make peace between them and make them understand what they did was wrong. 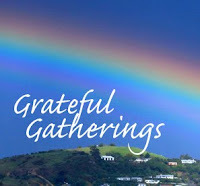 But Connie cared enough to speak to them, find out what happened, and educate both boys. I would have done the same, and be thankful for friends who care for my child, as they do their own. Ha! I will gladly let you and Connie take over while I eat. :p I feel that Mama B has a right to speak to both kiddos and I actually do think that it is good to have another figure step in to talk to my kiddo too - adds a different angle, provides a different dimension. Primarily because (and sad to say) our kiddos sometimes tune out once we start to preach. Well done for staying cool Connie and Jen! Hmmmm I got lost somewhere but caught the gist of it :D I would let friends I trust do it, and also find out from poppy what happened. It's sometimes hard for the one doing the disciplining to not take sides, especially if her own child is within the group of children. I think the most important thing is that you and the friend/relative doing the disciplining know each other well enough that you are aware of each others approach and boundaries so you won't do anything that the other parent disagrees with. So it's not something I'd be comfortable with just anyone doing but close friends and family would be fine. 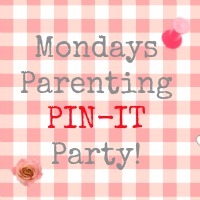 A really interesting post, thanks for linking up to the Parenting Pin-it Party.